Directions to Stop #7: Turn around and return the 1.1 mies to to US Highway 54. Turn left (east) onto US Highway 54. After driving about 17.5 miles you will come to Nevada, Missouri and the intersection with US Highway 71. Take the on ramp on the right to get headed south on Highway 71. After about 67 miles you will come to the intersection with US Highway 60. Take the exit and turn left (east). Drive east on Highway 60 for about 7.5 miles until you reach State Highway M. Turn right (south) and continue for about 2.9 miles to Mill Street. 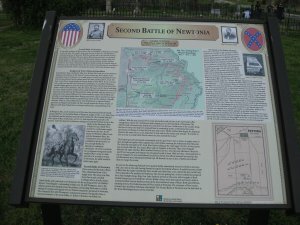 Turn left (east) onto Mill Street and the Newtonia Battlefield should be just ahead of you. 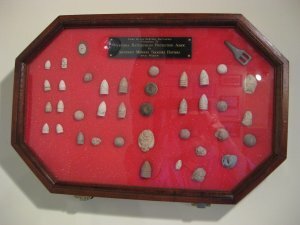 This tour stop is located in Newtonia, Missouri 64853. 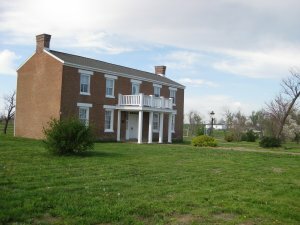 Description: Today, most of the battlefield is in private hands, but about 20 acres, plus the Ritchey mansion, are owned by the Newtonia Battlefield Preservation Society. Price continued his retreat at 2:00 A.M. on October 26th. They soon crossed back into Missouri heading in the direction of Carthage. They stopped near Carthage after marching for 56 miles. They rested and then moved to Newtonia and camped the night of October 28th. Against Shelby's objections, Price decided to stay here for a couple of days to rest his army. After Pleasonton had arrived in Fort Scott he sent a wire to Rosecrans recommending that his division cease it s participation in the pursuit of Price. Rosecrans did not do this. On October 26th, Pleasonton informed Curtis that he was ill and could not continue the pursuit but that the Missouri cavalry was still to be included. Once again the pursuit was slow in getting started. Major General Jame G. Blunt's Division got going by noon on October 26th. Brigadier General John McNeil's Brigade followed Blunt. Brigadier John B. Sanborn's Brigade left in the afternoon and Lieutenant Colonel Frederick W. Benteen's Brigade did not get started until October 27th. Curtis followed after Benteen. Colonel John F. Philips' Brigade stayed in Fort Scott to guard the prisoners. Curtis had about 5,000 men to continue the pursuit. Blunt finally caught up with Price near Newtonia on October 28th. He caught the Confederates by surprise, but only had about 1,000 men available in his initial attack. Once again Price sent Shelby to fight off the Federal attack. Only Blunt's artillery and superior arms kept the more numerous Confederates from flanking his position. By afternoon, however, Blunt's ammunition was running low and his position was again being flanked by the Confederate forces. But Sanborn's Brigade came up and attacking the flanking Confederate forces. By now it was dusk and the Confederates withdrew with Prices army to the south. 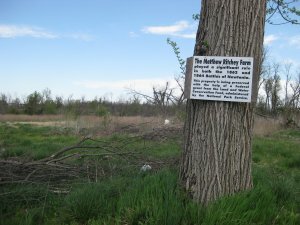 The Matthew Ritchey Farm played a significant role in both the 1862 and 1864 Battles of Newtonia. 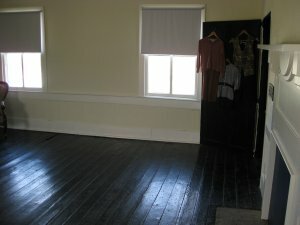 This property is being preserved with the help a Federal grant from the Land and Water Conservation Fund, administered by the National Park Service.